reviews the literature of this rare and devastating disease. multiple bilateral nodular opacities and vascular crowding. charged from the hospital on postoperative day four. 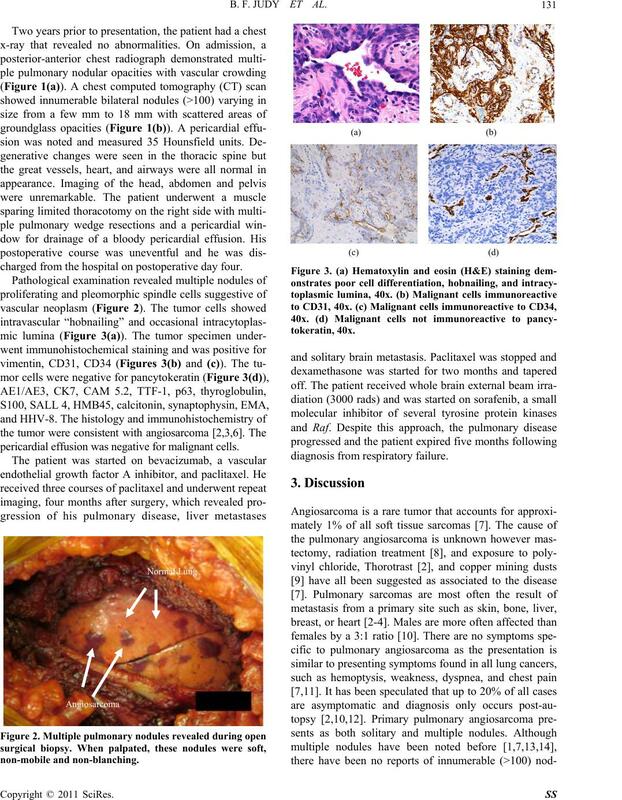 pericardial effusion was negative for malignant cells . B. F. JUDY ET AL. which indicates the lack of literature on the topic. in our case is negative. killer cells and lymphokine-activated killer cells [4, 18]. gemcitabine into the DNA [3,21,22]. Cancer, Vol. 70, No. 3, 2010, pp. 352-356. Chest, Vol. 103, No. 5, 1993, pp. 1531-1535. Cancer, Vol. 61, No. 1, 2008, pp. 131-136. Vol. 124, No. 6, 2003, pp. 2397-2400. Vol. 63, No. 1, 2007, pp. 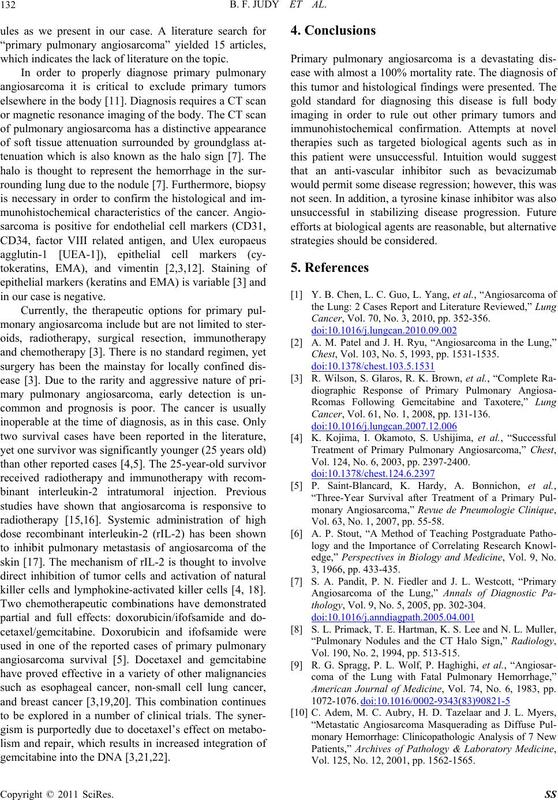 55-58.
edge,” Perspectives in Biology and Medicine, Vol. 9, No. thology, Vol. 9, No. 5, 2005, pp. 302-304. Vol. 190, No. 2, 1994, pp. 513-515. 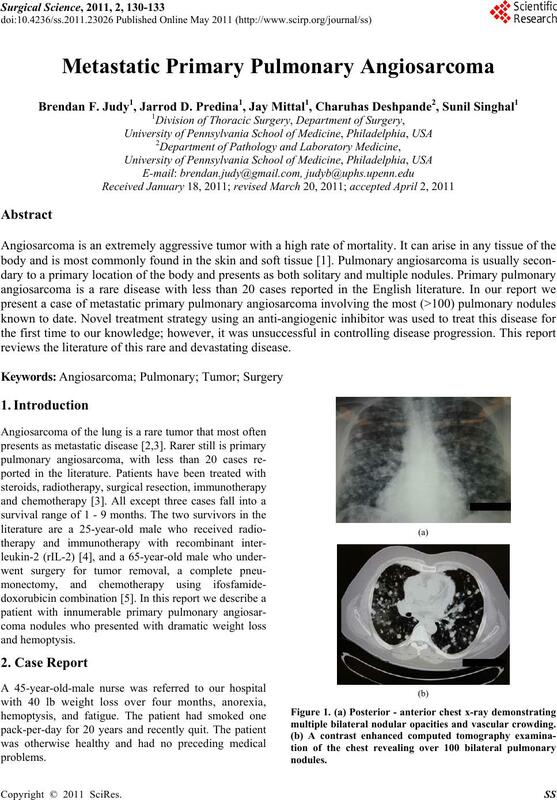 American Journal of Medicine, Vol. 74, No. 6, 1983, pp. Vol. 125, No. 12, 2001, pp. 1562-1565. Conference,” Heart Lung Circ, Vol. 19, No. 10, pp. Chest, Vol. 94, No. 1, 1988, pp. 214-216. No. 2, 1986, pp. 112-115. Cancer, Vol. 59, No. 5, 1987, pp. 1046-1057. Oncology Biology Physics, Vol. 52, No. 4, 2002, pp. tology, Vol. 34, No. 11, 1995, pp. 811-816. Clinical Imaging, Vol. 25, No. 5, 2001, pp. 337-340. Oncology, Vol. 22, No. 9, 2004, pp. 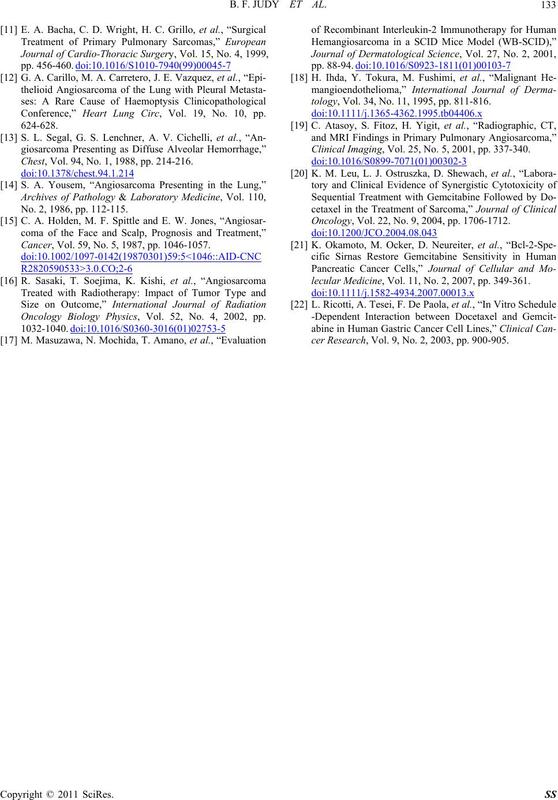 1706-1712.
lecular Medicine, Vol. 11, No. 2, 2007, pp. 349-361.
cer Research, Vol. 9, No. 2, 2003, pp. 900-905.